The Twilight Saga: New Moon dominated last night's MTV Movie Awards, netting gongs in five categories. The vampire romance sequel scooped acting prizes for stars Kristen Stewart and Robert Pattinson, while the latter was also crowned 'Global Superstar'. In addition, New Moon won the 'Best Movie' award and Stewart and Pattinson took home the trophy for 'Best Kiss'. The couple tentatively recreated their on-screen clinch on stage. "To be perfectly honest with you, it takes a lot of smoke and mirrors to make us look good kissing," said Stewart. Are you a big Twilight fan? or know someone who is? 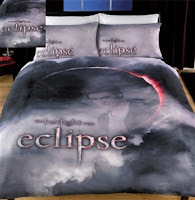 Check out the range of Twilight items on offer at 24studio.co.uk.